The panoramas displayed on these pages are a visual compromise: they have been reduced and compressed considerably so that the images are about 100KB, which allows them each to download in about thirty seconds over a 56K modem. On a network or cable modem, the images should download in just a few seconds. 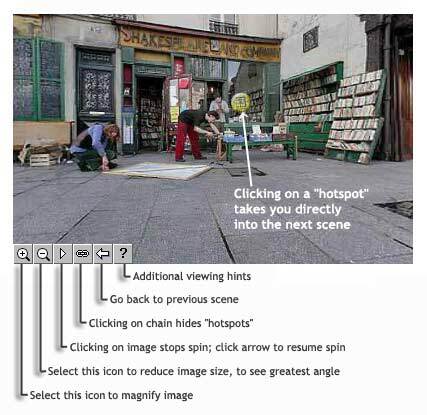 Keeping the images at higher resolution (larger image, much clearer detail) would make them unwieldy for the average web-surfer, making for intolerably long waits while the image is downloading to your computer. On the other hand, reducing image and filesize further would make the images very small and blurry. The wealth of visual detail in the bookstore demands a certain level of image quality; as such, the filesize and image size chosen by the creator of this page were carefully weighed so as to yield the best possible image given the speed limitations of the internet.